Sometimes no matter how much you want something to work out for you, it just doesn’t. I had the highest hopes for this Archie Shirt by Sew Tina Givens. Tina Givens designs flowing, Lagenlook fashions, and while I’m not really a Lagenlook wearer myself, I do appreciate the style and I’m not afraid to incorporate the styles into my own personal style. I chose the Archie Shirt because it is shown in what looks like heavier fabric vs the mostly linen or lightweight cotton styles of the other patterns. It’s almost a jacket look and similar to something you may see from the Tilton sisters. It just does nothing for me. It would be better in a lighter weight/color, but that wouldn’t solve the problems of a very weird armscye shape (major fabric bunching there) and that collar…. oh my that collar is huge and just not right. I went over the pattern a few times making sure I cut it correctly and sewed it on properly. It’s just awkward. The darts could have been sewn lower, that is my fault for not adjusting that, and the pattern calls for mostly raw edges (including the collar), but flannel raw edges just don’t appeal to me so I used regular, boring finished edges for the most part. Would the raw edge finish help the collar? Perhaps, a little, but the shape would still be, well, awkward. 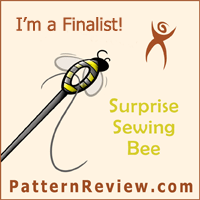 There are some things I like about the pattern – like the zig-zag sewn darts. The pattern also calls for patches of trim fabric sewn in a few places. I skipped most but added this one at the back collar. I used the same fabric for the pockets. I could go back and try to re-work the pattern by re-drawing the shoulder/sleeve and the collar. But I doubt I will. It’s just not for me. I do think this pattern could work for someone with different proportions – larger upper body with more substantial shoulders perhaps?